In today’s date we can see people facing high blood pressure levels or low blood pressure issues every now and then. Blood Pressure or BP is the condition where pressure while circulating the blood all over the body exerts on blood vessel walls. The normal adult person must have blood pressure in the range of 120-80 mmHg. Based on age the blood pressure levels will be slightly different. Blood pressure generally measured in 2 ways namely systolic pressure and diastolic pressure. Systolic pressure is measure of pressure exerted during heart contraction and pumping the blood into vessels. Diastolic pressure is measure of the pressure exerted when heart gets relaxed and fills up with the blood. Blood Pressure levels lower compared to normal, this condition is known as Hypotension or low BP. Low BP can cause dizziness. Blood pressure levels higher compared to normal levels, this condition is known as Hypertension or high BP. high BP can cause excess strain on arteries and heart. Generally aging can cause high levels of Blood Pressure in individuals. Blood pressure can vary every now and then. 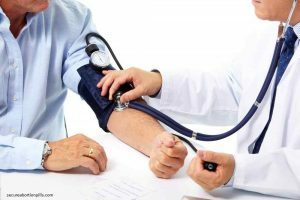 What are the reasons behind abnormal blood pressure levels? There are many reasons behind abnormal blood pressure levels. Some of the causes can be various disorders, improper diet, consumption of common salt in excess amount, emotional or physical strain, smoking habits, sedentary lifestyle, genetically passed from parents, obesity, excess intake of nicotine, excess intake of coffee, extra consumption of birth control medicines, excess body weight, pregnancy and many more. What changes can be done in lifestyle and diet for normal BP levels? Common salt consumption should be reduced. Avoid excess intake of food from restaurants which usually contains excess salt. Try to consume more calcium, potassium and magnesium rich foods. Make exercise as routine which can increase the capacity of heart. Maintain the ideal weight. Add lots of fruits and vegetables in diet. Take dairy products containing less fat. Relax yourself and don’t get stressed. Avoid excess consumption of alcohol, supplements and medicines. Try to adopt yoga and meditation activities every day. Try to intake dark chocolates everyday which can be helpful to slightly lower the high BP level. It is always recommended to go for health checkup every 6 months and keep monitoring on regular basis and take relevant medicines referred by physician. On long run severe high BP levels can cause major damage to heart, kidney, can cause stroke also. Try to add recreational activities which can calm you down and reduce the stress levels, practice deep breathing. Avoid stressing yourself on wrong things in life, take things positively and try to be confident. Try to figure out the factors which triggers stress in your life, from next time try to avoid them or try to find a solution to such problems so that you will not be stressed again. In case of severe changes in BP levels, it is always suggested to talk to your doctor and follow the guidance and medicine given by them.